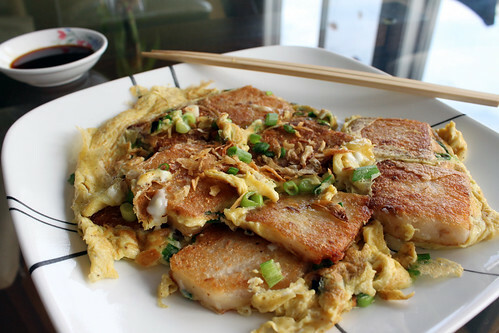 Fried Rice Flour Cake with Egg, or in Vietnamese, Bánh Bột Chiên Trứng is a great omelette-type dish that can be enjoyed as an appetizer or a main dish anytime of day. I order this dish every time we eat at Thien Long Restaurant (one of my favorite Vietnamese Restaurants) in San Jose. The crisp exterior of the rice cake dipped in a tangy soy sauce is ridiculously addicting and delicious. I wonder how a dish that looks so simple to prepare hits the spot so gooood. 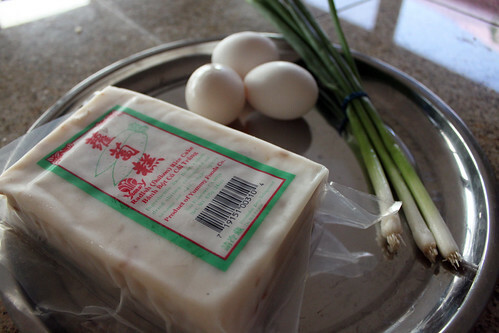 When I was walking down the refrigerated aisle at Lion Market to look for some tofu, I saw prepackaged rice cakes on sale for ~$3.50 for a big block. Since I already had scallions and eggs at home, I just bought it so Jane and I can make breakfast on Saturday morning. This recipe is super duper easy to make and a dish I will certainly make again in the future. Note: I think the restaurant uses Red wine vinegar. I didn’t have that, so I just used Rice Wine Vinegar instead. I think regular distilled vinegar would work too. 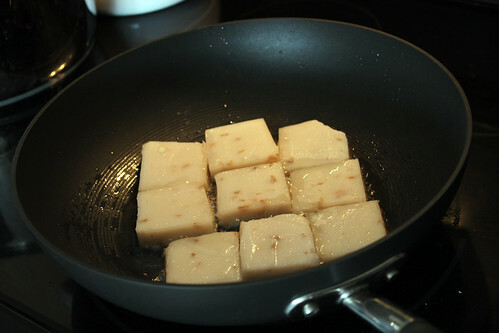 In a small bowl, whisk soy sauce, rice wine vinegar, salt, sugar, and Sriracha until ingredients meld together. 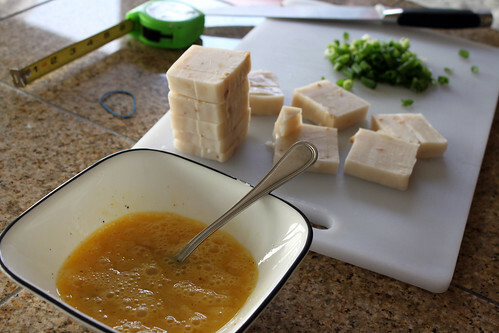 Cut flour rice cakes into 1-inch thick squares. Wash and finely dice scallions and set aside. Crack 3 eggs and put it in a small bowl. Season with salt and pepper to taste and beat the eggs. Place wok or frying pan on the stovetop and turn the heat on Medium. 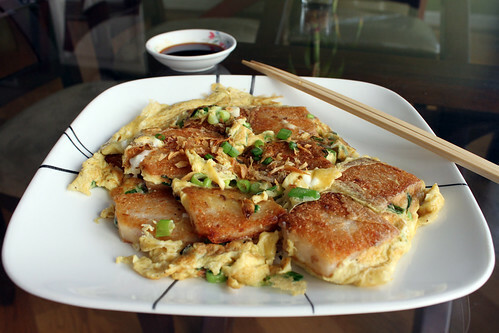 When heat is hot, add oil and fry flour rice cakes until both sides are brown and crisp. Sprinkle diced scallions all over flour rice cakes. 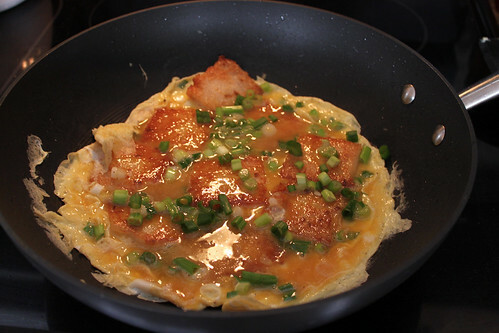 Pour egg over flour rice cakes and scallions and let the egg set then flip and cook the other side. I like to try to keep the egg hold the flour rice cakes together, but it might break up when you flip it. Plate, sprinkle fried shallots and any extra diced scallions on top and serve with dipping sauce.